There's nothing more annoying than when your iPhone accelerometer decides a photo should be taken the other way around. You've snapped a fabulous picture of your cat/dog/child, but on your screen, it's sideways and impossible to look at. Turning the phone is no use either, as it just keeps spinning the photo to the wrong orientation. If you're wondering how to rotate photos on iPhone, it's simple; here's how. 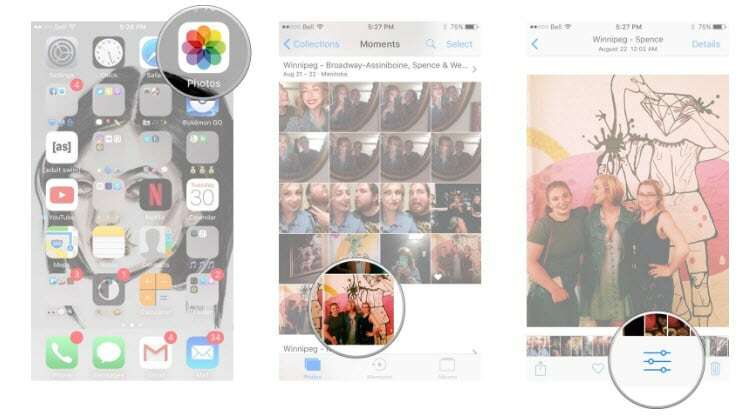 The Photos app comes pre-installed on all iPhones and iPads, so no download needed. Scroll through your images until you find the one that doesn't look quite right. It's the button at the bottom which looks like three lines with circles on them. This button looks like a rectangle with arrows circling it and is found next to 'cancel'. This is a white square with one arrow, which you'll find just above 'cancel'. One tap will rotate your image 90 degrees. One more will rotate it 180, and so on. Once you're completely happy with the rotation of the picture, tap the yellow 'done' button to save your changes. It really is as simple as that. 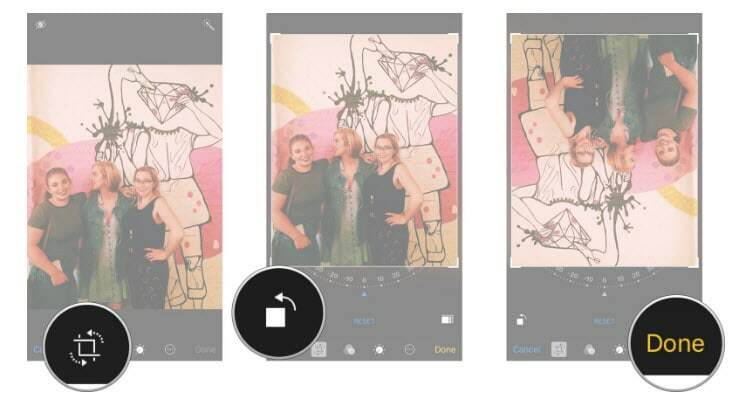 Unfortunately, Apple saw fit to hide the rotation function within the button used for cropping pictures, so many users overlook this functionality. But now, you don't have to, as you know how to rotate photos on iPhone so that every image is perfect! When iOS 5 brought us the ability to take photos on iPhones with the volume buttons, iPhone users rejoiced. At last, there was an easier way to snap images quickly, and without needing a spare finger to tap the screen. However, with this intervention also came a new problem; upside down photos. If you're in the habit of taking photos using your volume buttons, it feels natural to have these buttons at the top of the phone when shooting in portrait mode. After all, the shutter buttons on our digital cameras are at the top, so it's natural to want to put the volume buttons there too. But when you shoot like this, all your images will display upside down when you upload them to your social media or laptop, if you're a Windows user. If you use a Mac, the PC will recognize the image is upside down and will change it, but if you send that picture to a client or friend on Windows, it will, once again, be the wrong way up. 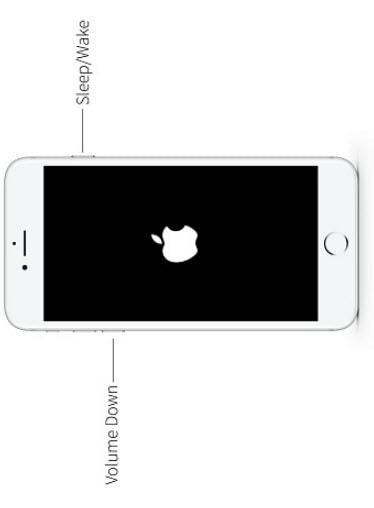 Take a glance at the lens position on the back of the phone. Whether you're taking a portrait or landscape picture, the lens should always be at the top. Having the volume buttons at the bottom might feel weird at first, but with a little practice, you'll get used to it. Because you're using the volume buttons in their correct position, you might be tempted to splay your fingers across the back of the phone, covering the lens. If you're a habitual upside-down photo-taker, it may take a little while to break this bad habit. At least now, if you do take a photo upside-down, you know how to rotate photos on iPhone using the Photos app. With a bit of practice, however, it will soon feel natural to hold the camera in its proper orientation. iPhones are wonderful devices for budding photographers of all shapes and sizes. No other smartphone can come close to the capabilities of Apple's iPhone in terms of picture quality, functionality and scope. By getting to know some of the hidden tricks and tools to improve your images, you'll be the envy of every Instagrammer on the planet!